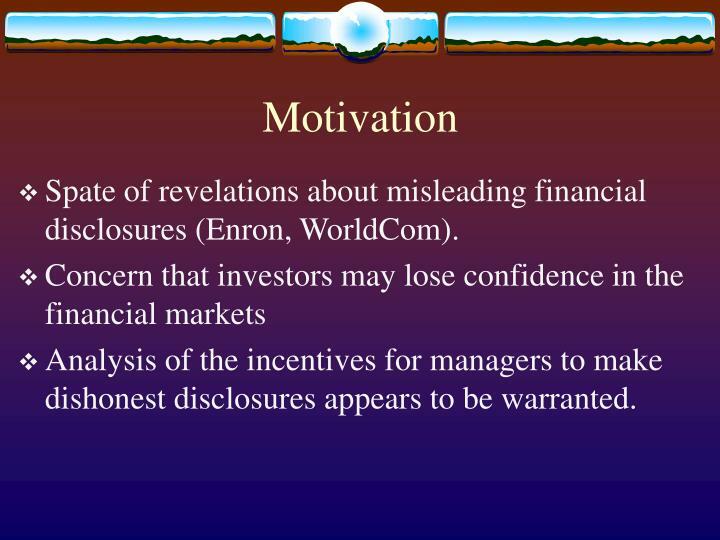 Spate of revelations about misleading financial disclosures (Enron, WorldCom). 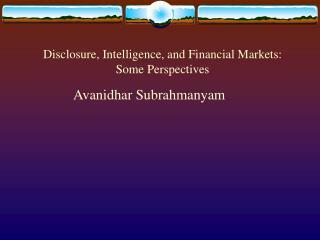 Analysis of the incentives for managers to make dishonest disclosures appears to be warranted. 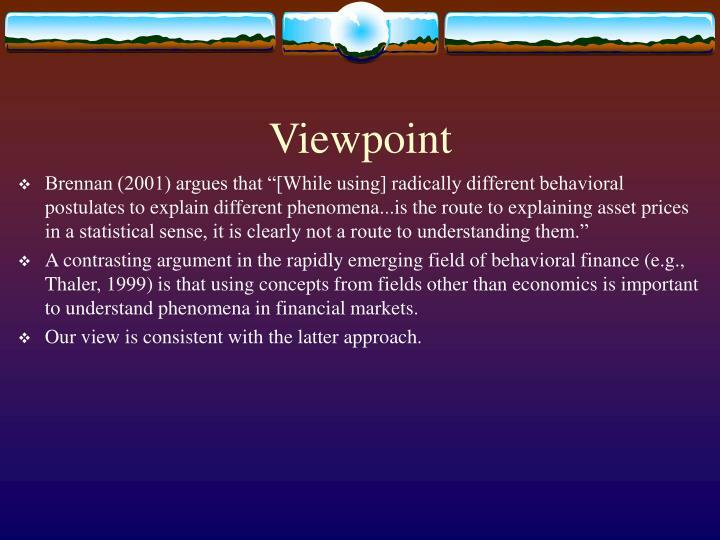 A contrasting argument in the rapidly emerging field of behavioral finance (e.g., Thaler, 1999) is that using concepts from fields other than economics is important to understand phenomena in financial markets. 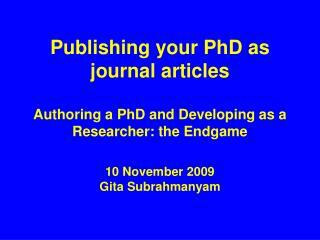 Our view is consistent with the latter approach. Chevalier and Ellison (1999) find that indicators of intellectual prowess (specifically, SAT scores) are positively related to managerial performance in mutual funds. 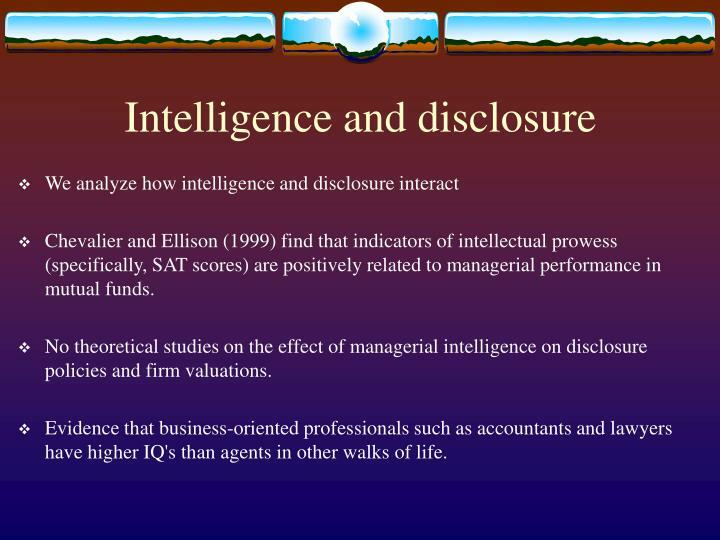 No theoretical studies on the effect of managerial intelligence on disclosure policies and firm valuations. Evidence that business-oriented professionals such as accountants and lawyers have higher IQ's than agents in other walks of life. 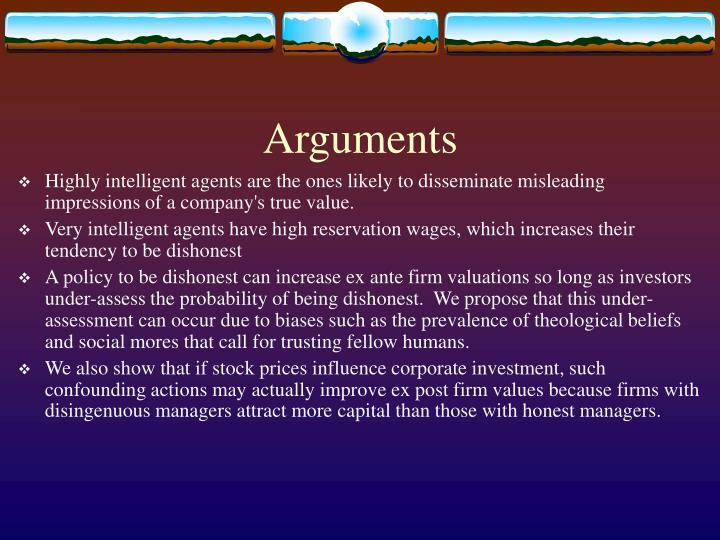 Highly intelligent agents are the ones likely to disseminate misleading impressions of a company's true value. 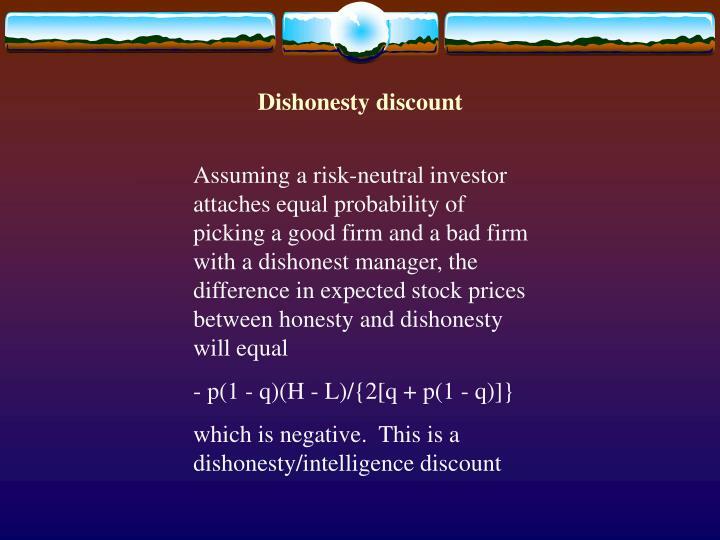 A policy to be dishonest can increase ex ante firm valuations so long as investors under-assess the probability of being dishonest. We propose that this under-assessment can occur due to biases such as the prevalence of theological beliefs and social mores that call for trusting fellow humans. We also show that if stock prices influence corporate investment, such confounding actions may actually improve ex post firm values because firms with disingenuous managers attract more capital than those with honest managers. 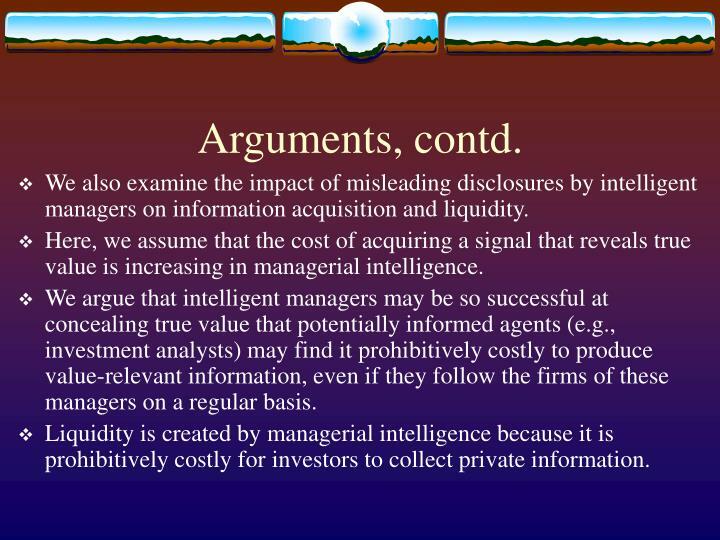 We also examine the impact of misleading disclosures by intelligent managers on information acquisition and liquidity. Here, we assume that the cost of acquiring a signal that reveals true value is increasing in managerial intelligence. We argue that intelligent managers may be so successful at concealing true value that potentially informed agents (e.g., investment analysts) may find it prohibitively costly to produce value-relevant information, even if they follow the firms of these managers on a regular basis. 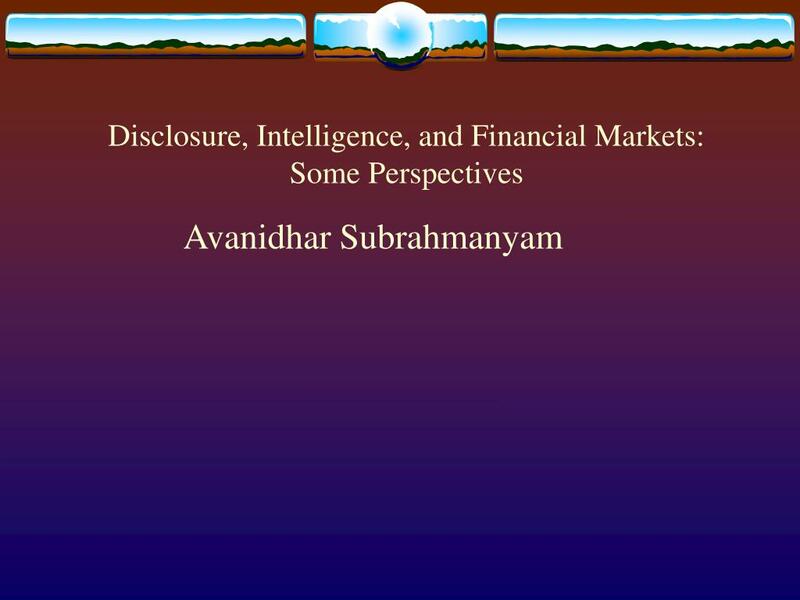 Liquidity is created by managerial intelligence because it is prohibitively costly for investors to collect private information. 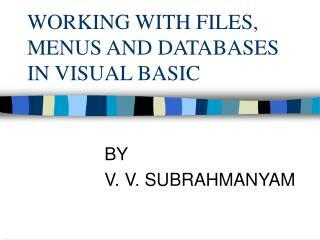 Consider a firm with a value v that can equal H or L, with H >L. The value of the firm is revealed at time 1. 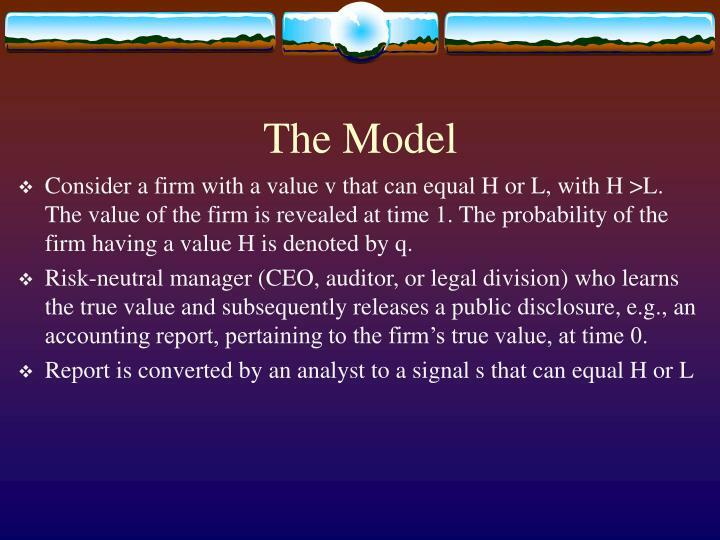 The probability of the firm having a value H is denoted by q.
Risk-neutral manager (CEO, auditor, or legal division) who learns the true value and subsequently releases a public disclosure, e.g., an accounting report, pertaining to the firm’s true value, at time 0. The signal s is observed by the BOD as well as the outside investors. We represent the probability with which the analyst concludes that a firm worth L (H) is actually worth H by p ( ). These probabilities are control variables for the manager. This captures the notion that the manager is able to control the degree of fudging by various means (disingenuous statements, off-balance-sheet partnerships, and so on). 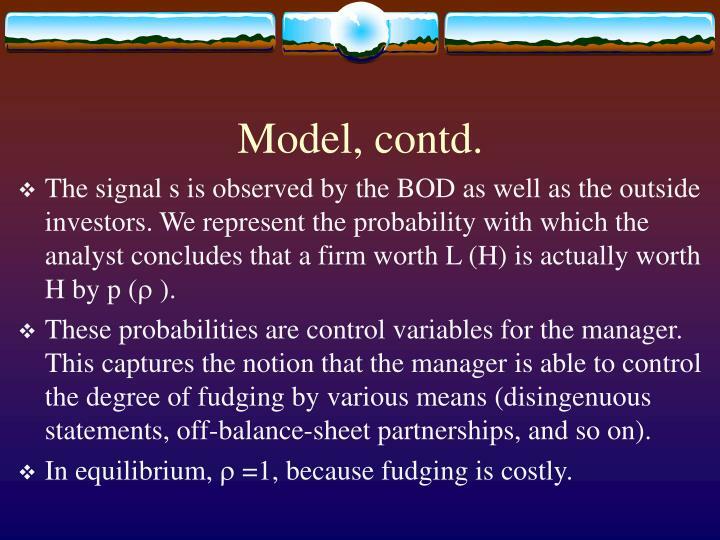 In equilibrium,  =1, because fudging is costly. 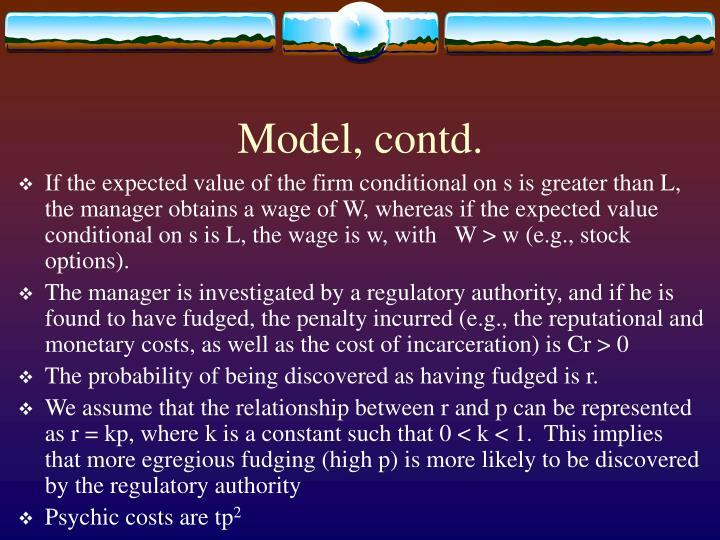 If the expected value of the firm conditional on s is greater than L, the manager obtains a wage of W, whereas if the expected value conditional on s is L, the wage is w, with W > w (e.g., stock options). 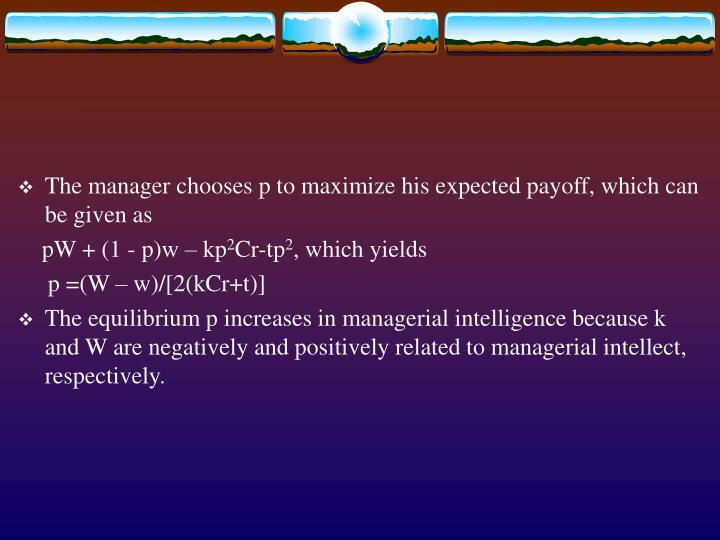 The probability of being discovered as having fudged is r.
The equilibrium p increases in managerial intelligence because k and W are negatively and positively related to managerial intellect, respectively. 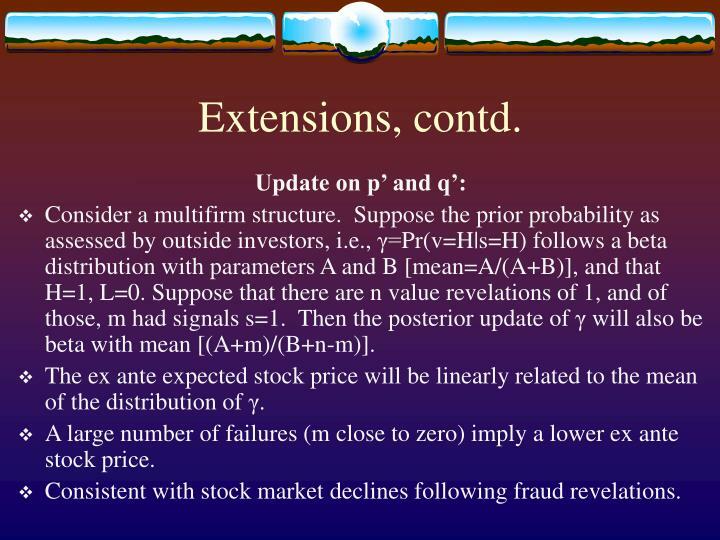 Suppose for outside investors, p’≠ p, and q’ ≠ q. 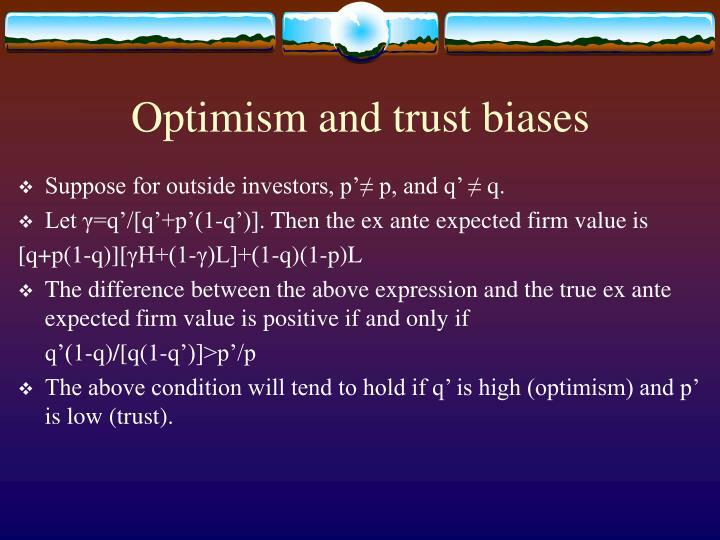 The above condition will tend to hold if q’ is high (optimism) and p’ is low (trust). 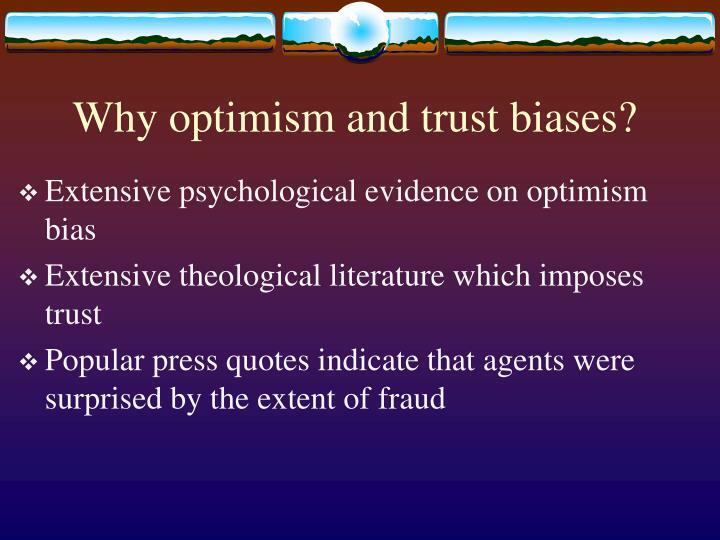 Why optimism and trust biases? 1. 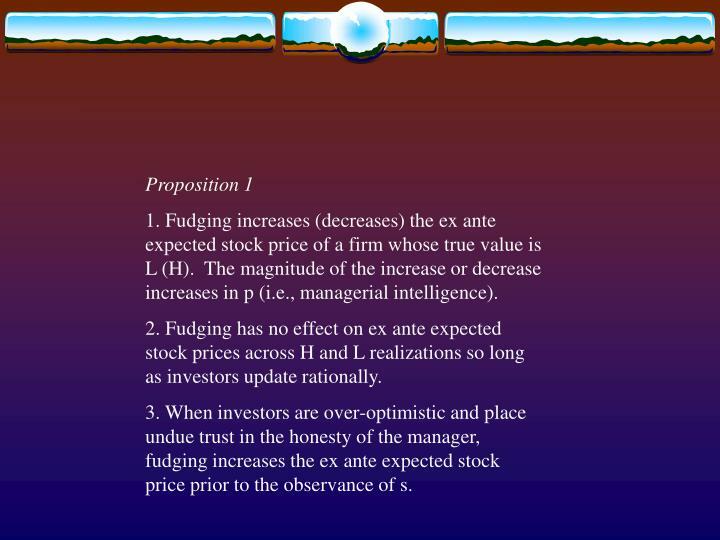 Fudging increases (decreases) the ex ante expected stock price of a firm whose true value is L (H). 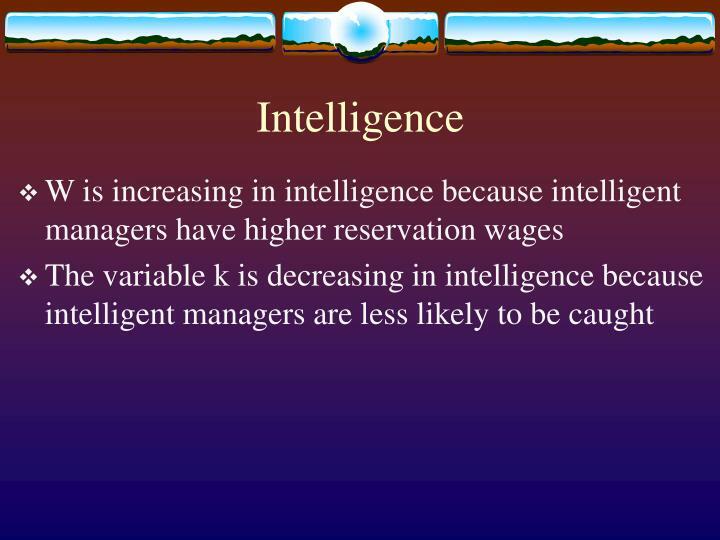 The magnitude of the increase or decrease increases in p (i.e., managerial intelligence). 2. Fudging has no effect on ex ante expected stock prices across H and L realizations so long as investors update rationally. 3. 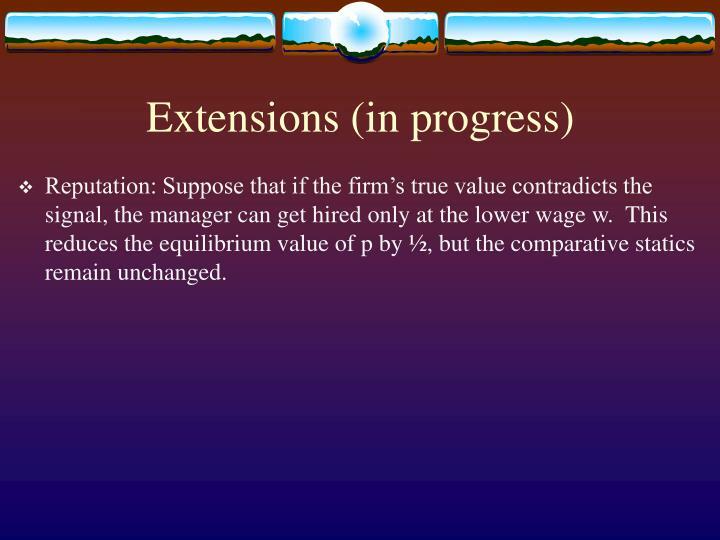 When investors are over-optimistic and place undue trust in the honesty of the manager, fudging increases the ex ante expected stock price prior to the observance of s.
Reputation: Suppose that if the firm’s true value contradicts the signal, the manager can get hired only at the lower wage w. This reduces the equilibrium value of p by ½, but the comparative statics remain unchanged. Consider a multifirm structure. Suppose the prior probability as assessed by outside investors, i.e., γ=Pr(v=H|s=H) follows a beta distribution with parameters A and B [mean=A/(A+B)], and that H=1, L=0. 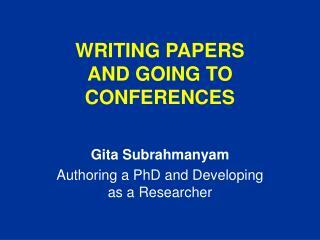 Suppose that there are n value revelations of 1, and of those, m had signals s=1. Then the posterior update of γ will also be beta with mean [(A+m)/(B+n-m)]. The ex ante expected stock price will be linearly related to the mean of the distribution of γ. A large number of failures (m close to zero) imply a lower ex ante stock price. Consistent with stock market declines following fraud revelations. 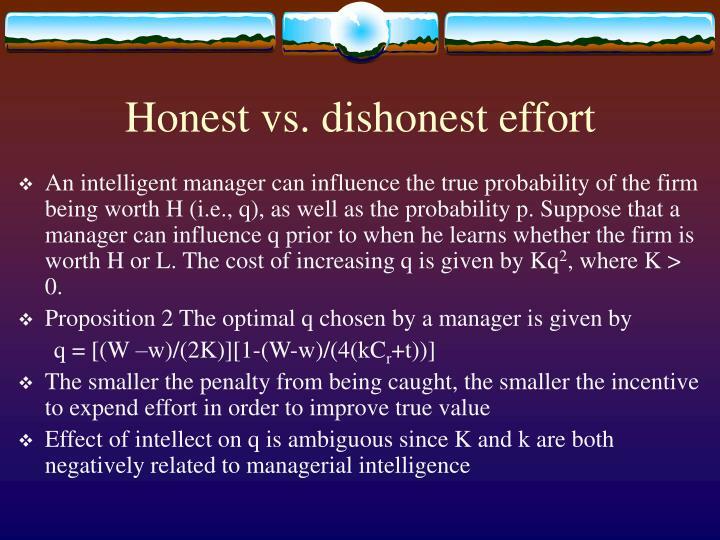 An intelligent manager can influence the true probability of the firm being worth H (i.e., q), as well as the probability p. Suppose that a manager can influence q prior to when he learns whether the firm is worth H or L. The cost of increasing q is given by Kq2, where K > 0. 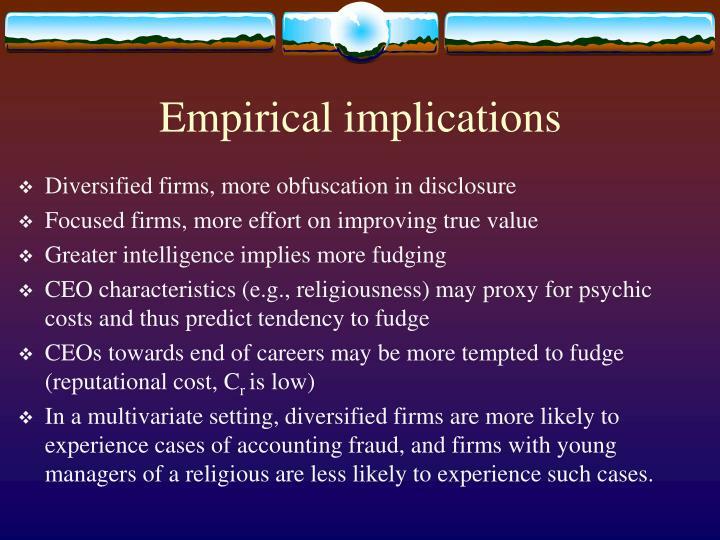 In a multivariate setting, diversified firms are more likely to experience cases of accounting fraud, and firms with young managers of a religious are less likely to experience such cases. 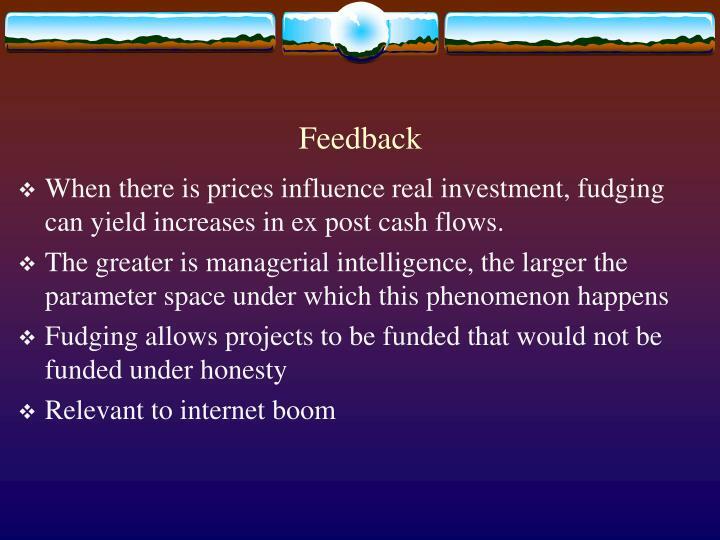 When there is prices influence real investment, fudging can yield increases in ex post cash flows. 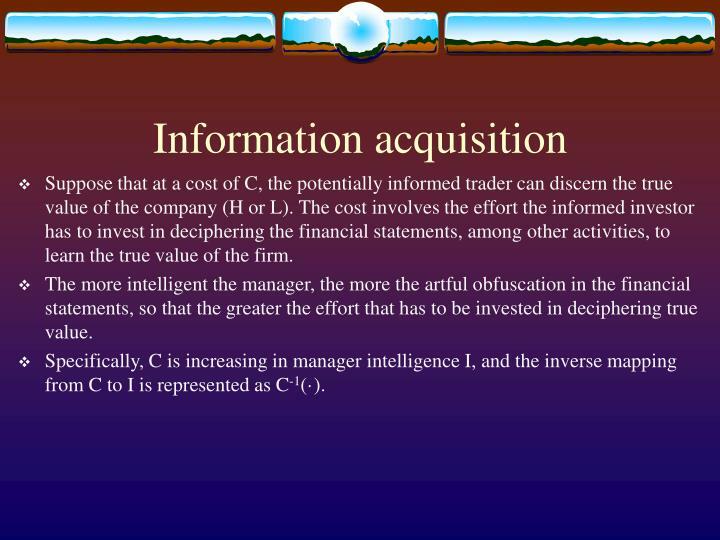 Suppose that at a cost of C, the potentially informed trader can discern the true value of the company (H or L). 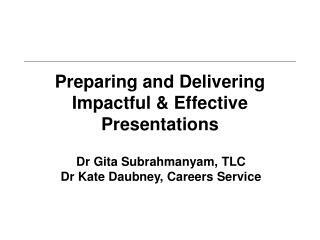 The cost involves the effort the informed investor has to invest in deciphering the financial statements, among other activities, to learn the true value of the firm. The more intelligent the manager, the more the artful obfuscation in the financial statements, so that the greater the effort that has to be invested in deciphering true value. 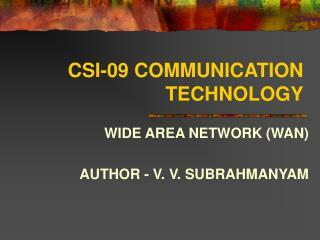 Specifically, C is increasing in manager intelligence I, and the inverse mapping from C to I is represented as C-1(·). So long as as managerial intelligence is sufficiently high, information about the firm is not acquired and the financial market is infinitely liquid (i.e., the bid-ask spread equals zero). 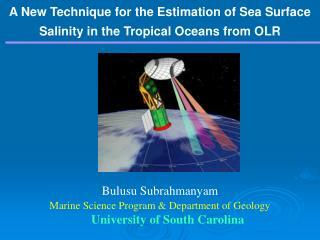 The threshold level of cost above which information is not collected, is maximized at p = 0.5. 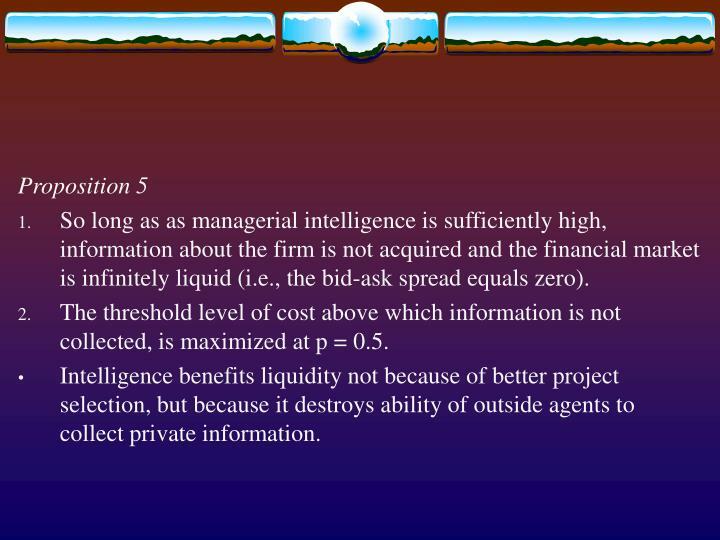 Intelligence benefits liquidity not because of better project selection, but because it destroys ability of outside agents to collect private information. While we consider the notion that intelligence has a direct positive influence on value creation, our principal emphasis is on some negative aspects of intellect. We propose that agents with high intellect are also likely to be adept at conveying misleading perceptions about firm values. 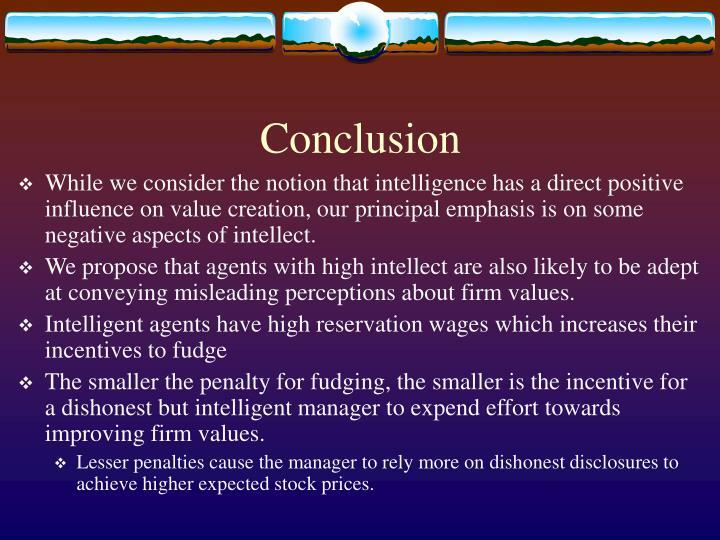 The smaller the penalty for fudging, the smaller is the incentive for a dishonest but intelligent manager to expend effort towards improving firm values. Lesser penalties cause the manager to rely more on dishonest disclosures to achieve higher expected stock prices. 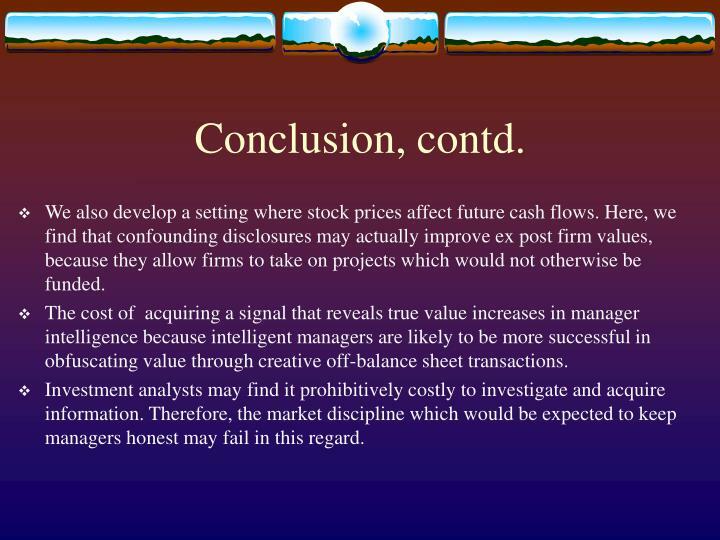 We also develop a setting where stock prices affect future cash flows. Here, we find that confounding disclosures may actually improve ex post firm values, because they allow firms to take on projects which would not otherwise be funded. The cost of acquiring a signal that reveals true value increases in manager intelligence because intelligent managers are likely to be more successful in obfuscating value through creative off-balance sheet transactions. Investment analysts may find it prohibitively costly to investigate and acquire information. 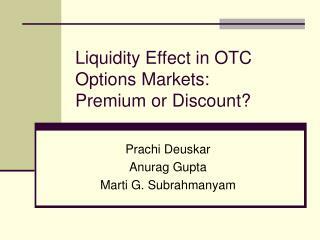 Therefore, the market discipline which would be expected to keep managers honest may fail in this regard. 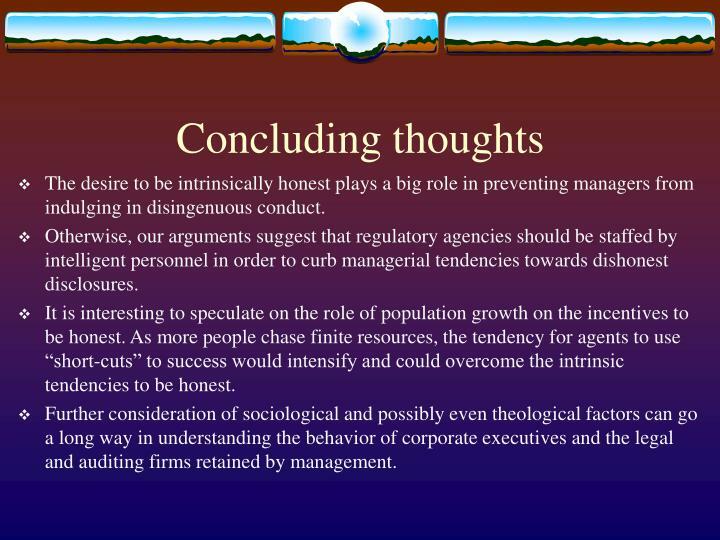 The desire to be intrinsically honest plays a big role in preventing managers from indulging in disingenuous conduct. Otherwise, our arguments suggest that regulatory agencies should be staffed by intelligent personnel in order to curb managerial tendencies towards dishonest disclosures. It is interesting to speculate on the role of population growth on the incentives to be honest. As more people chase finite resources, the tendency for agents to use “short-cuts” to success would intensify and could overcome the intrinsic tendencies to be honest. 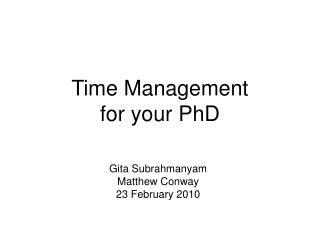 Further consideration of sociological and possibly even theological factors can go a long way in understanding the behavior of corporate executives and the legal and auditing firms retained by management.